Okay, it seems like now Portland is just showing off. 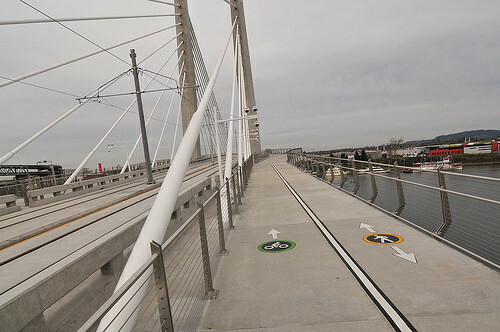 The city is putting the finishing touches on the Tilikum Bridge, a multi-modal span that will serve buses, cyclists, pedestrians and trains — but no cars. Elsewhere on the Network today: Decatur Metro reports that Atlanta’s $250 million infrastructure bond measure passed by an amazing 9-to-1 margin. An analysis by Greater Greater Washington finds DC drivers who kill cyclists typically face no penalty. And Transport Providence takes issue with the idea that a dog park should provide off-street parking. And no passing lanes. Good luck to anyone stuck behind someone who can’t climb on that high steep bridge. That bike lane looks wide enough to pass (bikes are narrow! ), and it would be fine enough to briefly intrude a bit into the ped lane for a quick pass (of course, being a responsible cyclist, you would wait until there was sufficient space with no peds). Other than that, where would you expect them to put a passing lane? The bridge has a fixed width, so any passing area would have to come from narrowing other lanes, and there just doesn’t seem to be any room for that. In any case, a bridge is short, if it’s so crowded that you can’t pass, you’ll live. In such conditions you should probably slow down anyway. Make it 4 meters wider, that leaves enough room for another Oregon-typical bicycle lane width of 2 meters and would allow for both shy distance from the guardrails and a legal passing opportunity.